Welcome back dear coaches. Interested who were the shining stars in our week 3 games and received the benefit of the curse to be casted upon them? This year the curse is malfunctioning so far, as both Number 1 from previous weeks are still alive. Time to fix that. For the past few weeks I voiced a few complains that claw in DIV1 is not realy working and the Bash team are blooming. I am obviously a whining elf coach in said division. However after the last game between Samoa and Slaanesh_Slaughterers I must shut up. Samoa started optimistically and stunned 2 and injured another beastman on LOS blocks. However at that point the things went sour for them. Zakyrel clearly did not get to kill Wood Elfs last week and was rather grumpy. This resulted in 3 kills and one knockout in 6 blocks and 6 armor breaks. The game was decided in turn 4. Samoa lost 2 Mighty Blow, Claw Chaos Warriors and Tackle, Block, Mighty Blow Beastman. I do not get to complain for at least 2 weeks now. 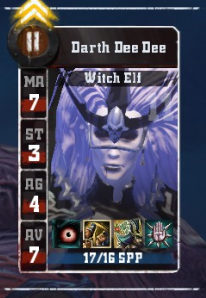 Angels of Lilith have little bit of a name in REBBL. In their first game few seasons back they got so utterly destroyed that there is an unoffical rule named after them that allows for team reroll in extreme situations. There have been several Angels of Lilith interations since, but Dark Angels of Lilith so far do not stand to their name. They won all their 3 games so far and by some crazy coincidence have not lost a single player yet (not counting week 4). To top it off their Witch Elf Darth Dee Dee has gotten on this list by breaking armor 3 times in 9 blocks, surfing 2 players, catching a pass and scoring the winning touchdown of the game. This is the second attempt from The Richest Tea to run Ogre team in Gman. This time around it survived Green Horn along with Tea's will to suffer Ogres for 13 more weeks. 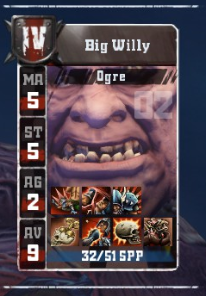 After burying Big Al and all his cousins (twice removed too) in his Human team last season, he did the mistake of calling one of the Ogres Big Al, which was rewarded by swift dead of said Ogre. Big Willy on the other hand is going strong. After getting Piling On as his first skill, he is now the best developed player on the team with Break Tackle and Juggernaut on top. 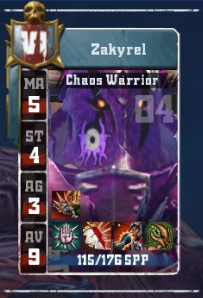 In the last game agaist Chaos team he blocked them 11 times, resulting in 6 armor breaks. 5 of those breaks meant KO or worse. In 2 cases the worse result was death.On the other hand, when someone piles on you with his big willy, maybe death is actually the better result after all. You do not always see the Norse team to be 5 players down by the end of turn 2 on THEIR own drive. This happened last week to Âlve and Limpwrist II was intergral part of that snowball effect. The Nercomantic were given a Blitz kickoff event and the initial blitz by Limpwrist II killed poor Seis. Way to die before the actual turn 1 starts. 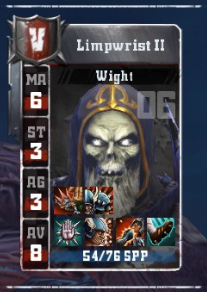 With Tackle, Mighty Blow, Block and Piling On the Wight is dedicated killer to handle vermins like elfs, stunties and rats but he does now shy away from punching some Norse as well. And punching he did. He touched the naked hot Norse bodies 12 times and broke their "armor" in 10 occassions. Apart the departed Seis he knocked out 3 more and badly hurt the STR5 Blodge, Break Tackle, Block Mighty Blow Ulf, nearly pitch clearing them by turn 6. Not so limp wrist after all. One of the latest stars of fantasy genre, Jamie Lannister, decided he is tired of slaying kings and shagging his sister Cersei. When he got the offer to grow back his hand for the exchange of his services to a bloodbowl team, he jumped after it without reading the fineprint. Next day he woke up as a rat and instead of golden hand he had an iron snot. 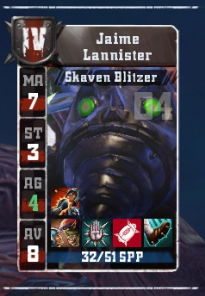 It was too late to back off now, and since he was promised to get new limb once getting 51 SPPs, he went nuts in the last game and in 2 blocks he broke armor twice and knocked out opposing players in both times. In an effort to get to level 5 as soon as possible he scored 3 amazing touchdowns. While punting the ball after scoring the third he was heard saying: "The things I do for claw." Only 19 SPPs to go Jamie and your new limb will be reality. See you next time and I can already tell there will be amazing record breaker.